This fun soccer ball skills exercise can be done with as little as two players. You work on several areas; long balls, accuracy, and ball control all in one simple drill. - Set up 2 boxes approximately 30 yards apart. - 1 player in each box, and 1 ball is all that is required. - Player 1 plays a long ball aiming to drop the ball in the box of player 2. - Player 2 must use one touch to bring the ball down under control within the box. - Player 2 then plays long ball to player 1, and exercise proceeds. - Crosser gets 1 point for crossing into the box, receiver receives 1 points for successfully bringing ball down under control. - If ball gets played outside of box, crosser receives 0 points. 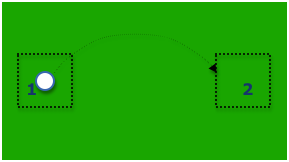 If receiver can use one touch to bring ball back into box and then bring down under control he/she receives 3 points. - All crosses should be accurate. - All touches to bring the ball down should be well controlled, and body in good balance. - Vary box distance and size to increase/reduce difficulty. - Add a passive defender to receiver, then have players switch each time. - 10 minutes for soccer ball skills.